A new radio telescope array developed by a consortium led by Caltech and now operating at the Owens Valley Radio Observatory has the ability to image simultaneously the entire sky at radio wavelengths with unmatched speed, helping astronomers to search for objects and phenomena that pulse, flicker, flare, or explode. A team of highly determined high school students discovered a never-before-seen pulsar by painstakingly analyzing data from the National Science Foundation’s (NSF) Robert C. Byrd Green Bank Telescope (GBT). 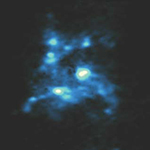 Further observations by astronomers using the GBT revealed that this pulsar has the widest orbit of any around a neutron star and is part of only a handful of double neutron star systems.